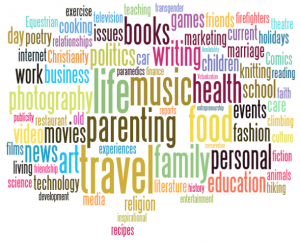 Travel, life, and parenting are popular topics in the English blogosphere as a whole; popular bloggers focus on politics. What captures bloggers’ attention? When we asked English-language bloggers to report the topics they had written about in the month prior to taking the survey, a mix of pleasures—food, music, travel—and daily responsibilities—parenting, life, family, and health—topped the list, with friends, education, and a smattering of hobbies (knitting, photography, movies) rounding out the top dozen topics. 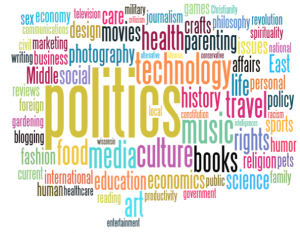 Among highly linked to blogs*, politics took the top spot, followed by technology, culture, music, and media. What did you blog about in the past month? Highly linked to bloggers are more likely to write about news, technology, science, and business; English-language bloggers in general are more likely to write about hobbies/crafts and parenting. 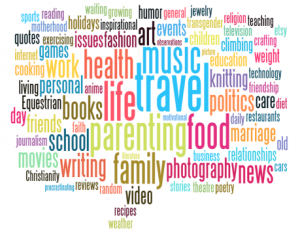 When given a list of possible blog topics and asked whether they write about these topics, highly linked to bloggers more frequently reported writing about news, technology, science, and business, while bloggers in general reported writing about parenting and family issues and hobbies, crafts, and professional interests. 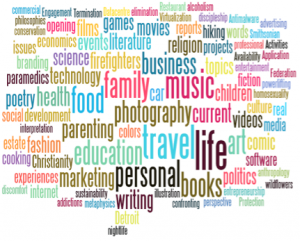 Do you blog about the following topics? Typical bloggers spend a third of their blogs writing about their personal lives; highly linked to bloggers tend to share commentary and opinion. On average, “diary and personal experience” makes up 36% of the content on blogs written by English-language bloggers. 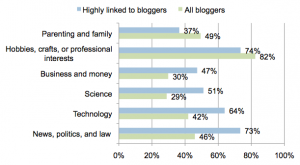 Popular bloggers spend only 18% of their blogs writing about their personal lives and 48% on commentary and opinion. What percentage of your blog is made up of the following? 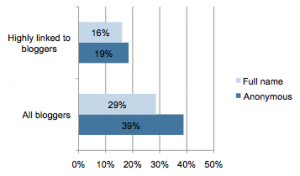 Over half—57%—of popular bloggers use their own names on their blogs; only 41% of general bloggers do. Anonymous bloggers are more likely to write about their personal lives, including travel and parenting, than bloggers who use their full names. Speaking of personal lives, only 41% of English-language bloggers blog under their full names. Twenty-six percent blog using only their first or last names; the rest—33%—blog using a pseudonym. Among popular bloggers, 56.6% blog under their full names, 11.6% use only their first or last names, and 32% use a pseudonym. Do you blog under your own name, or do you use a pseudonym or a made-up name? Perhaps unsurprisingly, bloggers who use their full names write less about their personal lives than bloggers who use only their first or last names or blog anonymously. Diary and personal experience make up only 16% of the content on highly linked to blogs and 29% of the content on all blogs written by people who use their full names, as compared to 19% and 39%, respectively, of the content on blogs written by bloggers who write under a pseudonym. What percentage of your blog is represented by diary and personal content? When it comes to specific topics, English-language bloggers who use their full names and bloggers who blog anonymously both write about travel, food, family, and music, but bloggers who write anonymously are more likely to write about parenting. Both general and popular bloggers write to express themselves creatively. Popular bloggers write to influence and motivate others, while bloggers in general write to document their personal experiences. When asked why they blog, over half of bloggers—57.3% of highly linked to bloggers and 70.6% of English-language bloggers in general—reported that creative expression is a “major reason” to blog. Approximately half of popular bloggers also blog to influence the way other people think (53%) or motivate other people to action (48%). English-language bloggers in general are less concerned with affecting the behavior of others, with barely over a quarter of bloggers reporting that they write to influence (26%) or motivate (27.3%) others. Instead, a majority of these bloggers—61.9%—report that documenting their personal experiences and sharing them with others is a “major reason” they blog. Please tell us if each of the factors below is a major reason you personally blog. These findings come from a survey of 439 English-language bloggers, age 18 or older, carried out between January 31 and March 24, 2011. The survey was conducted among a sample of 182 English-language bloggers, drawn from a random list of blog URLs generated by the web indexing service Spinn3r, and 285 “popular” bloggers, drawn from a link-based sample generated by Morningside Analytics. 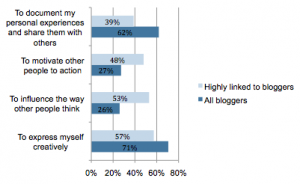 In the survey, we addressed respondents’ blogging habits and experience and their motivations for blogging.